Jump up and say HELLO! I've always been a stationery freak. Since I was in school, I will change, without fail, my stationery case once a year. I broke this habit once I entered college though, finding that I don't really need much more than just a couple of pens and a correction fluid. I used to love pencils, mechanical especially, and hated that I have to use pens when I entered high school. But after using pens for so long, writing with a pencil feels, not that interesting anymore. I don't like how it looks gray on paper, and easily removed. Pens, provide darker, more permanent stay on the paper. I've tried a few brands of pens, some of them are gel pens. Favorite gel pen: Pilot brand. G2 was too expensive for me, so I used the cheaper, refillable capped Pilot G1 pen. The problem with gel pen was, I cannot drop it even one bit. Once dropped, you will suffer the wrath of the pen not working. And since the ink is refillable, I always interchange between black and blue ink. When I was still sketching, the gel pen in black was the pen I used during inking. 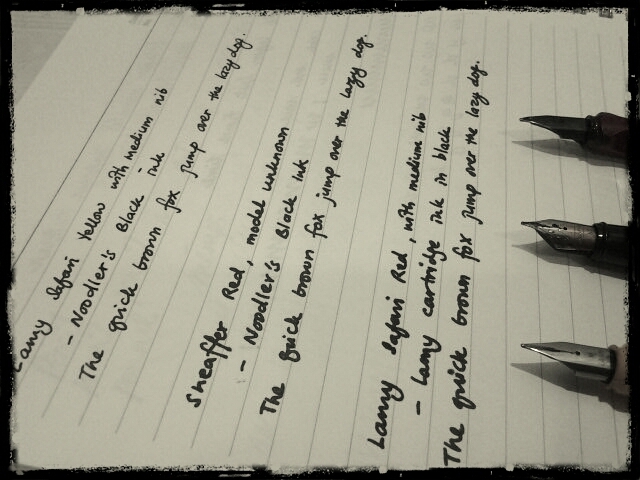 The Pilot pens that I used to use. I always go for the blue or the black. I loved using blue pens. I wrote all my notes, and did my home work in blue ink. But when I entered MRSM Jasin (I went to SMK Infant Jesus Convent from form 1 to form 3), towards the end of schooling year (which is form 5), I started using black pen, out of amusement. And then, I went the "Once you go black, you never go back" way. Black inks, all the way. Notes, assignments, doodles were (and are) done in black ink. My pens were always in black, and I had disliked the way blue ink looked like, as I do pencils. I still use pencils for sketching though, and that's the only time I hate to use a pen. I still haven't mastered the art of inking. Ah, pencils. 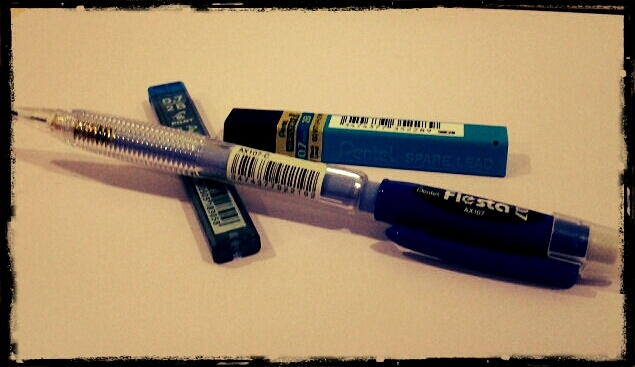 My all time favourite mechanical pencil, must be Pentel Fiesta 0.7mm in blue. The first one I bought when I was in form 5, and I lost it during the 6months break before starting college. And I will buy, without fail, the exact same model in same colour when the old one disappeared. I accidentally lost the pencil in uni when I was in Yogyakarta, which I replaced with another Pentel mechanical pencil, but in black (not Fiesta model though). I did find Fiesta, but it used 0.5mm lead, just like the black pencil I had, so I didn't buy it. It was impossible to find a 0.7mm pencil, even in art supply shop. Once I'm back for good in Malaysia though, one of the first few things that I bought was another Pentel Fiesta 0.7mm pencil with Pentel 0.7mm lead (which was sold as a set, you can easily find them in Jusco or other stationery shops). Pentel Fiesta 0.7mm. The Pilot lead is at least 5 years old. Favorite eraser? Of course Pentel Hi-Polymer Soft (the green one). For wooden pencils, I love Faber-Castell fancy wooden pencils ( I have the giraffe print pencil), their green-colored pencils for art with various softness, Staedtler Noris 2B pencil (haven't bought this for YEARS, but it's the only pencil I used for answering those pesky MCQs in school), and Staedtler Mars series with various softness. Hardest pencil I will use is 2B. I _hate_ HB pencils. Never liked them. The softest pencil I have used was 6B, and my fingers were messy from the lead. Not the one to be used for daily work, definitely. Lately, I found myself to write more and more with fountain pen. Yes, fountain pen. I have an old, Lamy Safari pen with medium nib, a memento from my dad. It was his favourite pen when he was alive, and the only pen he used to write all those reports (he was a school teacher, and then was promoted to administrative position). The cap is already cracked, the nib had seen so much use, that instead of medium, it produced really thick almost broad writing. Minus point for that pen was, it uses cartridge. Cartridges are easy, less messy solution to ink, but sadly, the pen that I use, Lamy, only accepts its own propriety cartridges. 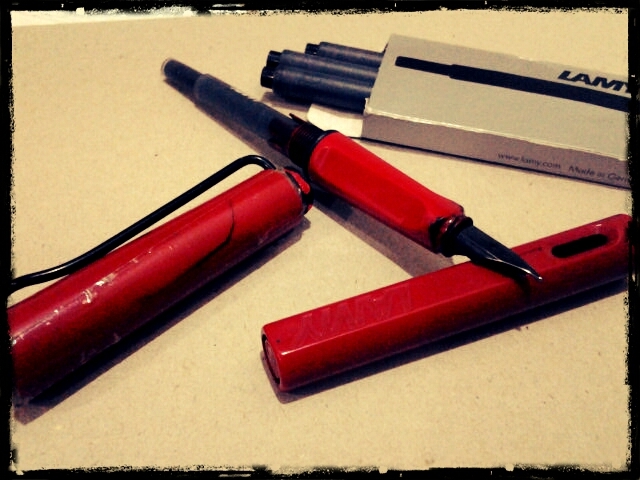 And I couldn't find a single shop that sells Lamy cartridges (or familiar with the brand) in Yogyakarta. And I think I had used the last ink doodling something insignificant. But because I was dead set on using the pen, I bought a bottle of Parker's Quink Black, stole a used syringe from the operation theater (don't worry, it was only used to administer anaesthetic to a patient thru IV line, the needle never did poke the skin), and I'm set. I refilled the cartridge with Quink Black, and started writing. Sad to say, the ink bleeds through paper, feathers, and absolutely not waterproof. Hence, I only used it for my notes, and not for medical records. 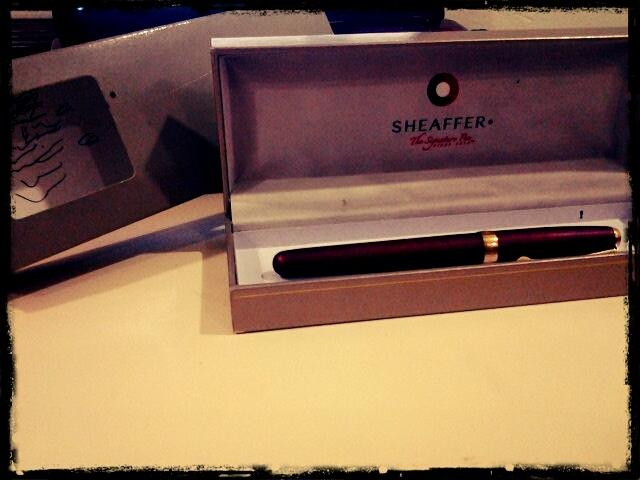 When I came home for good, mom passed me her Sheaffer pen in red, which I don't know what model it is. It still write in thick lines, despite the medium nib. The good thing about this Sheaffer pen is, it's using a piston type filler, which means, I only have to buy a bottle of ink, instead of hunting for cartridges. I still have an old bottle of Quink Black that dad bought me for my dip pen (yes, I have a dip pen with assorted nibs), which I used to fill it. Oh, the Quink I bought in Yogya? I left it there, for fear of spilling during shipping. Mom's Sheaffer, model unknown. A gift from dad. She doesn't use it though. Since I'm determined to use a fountain pen, I bought a "bulletproof" ink online, Noodler's Black. The manufacturer claimed that it is waterproof (the most important thing that I look in ink), fade proof, UVproof and forgery proof. Which means, it should be the perfect ink to be used for medical records. And it doesn't bleed. It does feather with my Sheaffer though. Noodler's Black ink and Parker Quink Black. 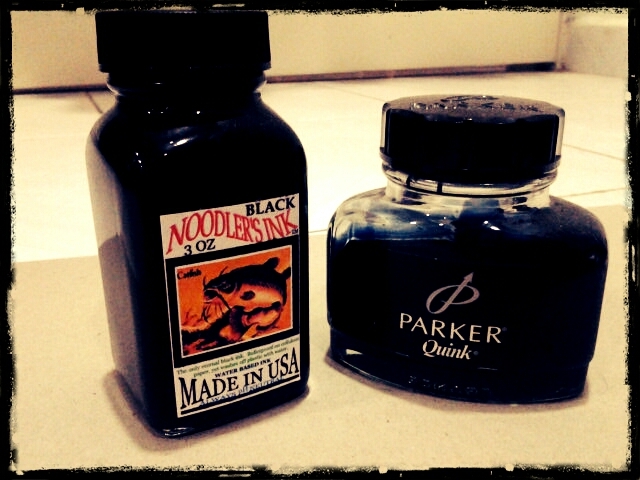 I have to order the Noodler's online, not available in Malaysia. The Quink must be 7-8 years old, perhaps older. Between the Sheaffer and the Lamy (which cap had failed me so many times, staining my beg, and key chain ornament), I prefer the Lamy. It's light, and feels comfortable in my hand. Even if the design has been described as bulky by some, but I like it, more comfortable grip. And since I'm crazy about the Lamy, I bought another one yesterday. For mere RM 65 ringgit. 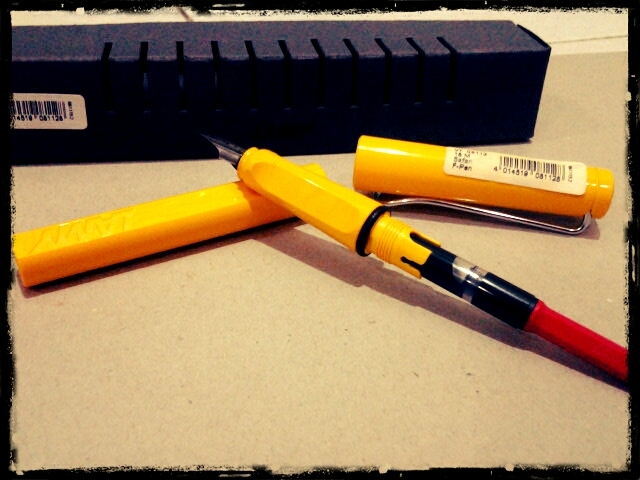 Which is very cheap, considering some shop in Malaysia selling Lamy Safari for a whopping RM 93. My new pen? It's in yellow. And it comes with a cartridge/converter, meaning I can use my Noodler's Black with it. And the cartridge it comes with? It went into the box of Lamy cartridges I recently bought. Setiap hari. Setiap hari dia menghadap mesej yang sama dari teman baiknya. Membualkan kata-kata serupa. Pertanyaan yang sama, dengan jawapan yang sama, yang mungkin bedanya hanya sedikit. Kasi customize sikit, supaya tak boring. Ayat sama tiap malam: Jom dinner, makan dekat mana. Walaupun berbeza jantina, mungkin kerana sudah terlalu rapat, temannya itu dianggap seperti saudara sendiri. Macam adik-beradik. Biarlah orang nak kata mereka berpacaran. Keluar berdua sampai entah mana-mana. Sampai tengah malam baru pulang. Atau keluar tengah malam, pagi baru balik, mengukur kota Yogyakarta dengan skuter birunya. Tapi memang hakikatnya, dia adalah teman. Yang boleh dia kutuk, dan boleh kutuk dia balik. Malam itu mereka keluar berdua lagi. Mencari makan malam yang enak, dan bervariasi sedikit dari rutin. Mau makan sedap. Dan murah. Dan itu memang gampang dicari di kota pelajar. Di tempat yang dipenuhi dengan mahasiswa dan mahasiswi dari serata Indonesia, makanan yang murah meriah harga mesra pelajar, mudah dicari. Cuma, harus tau mana yang tidak menyebabkan cirit-birit, mana yang ya. Mataku mengantuk. Tapi masih lagi tegar menghadap komputer. Kehidupan kaki internet, memang begini. Siang tidur, malam berjaga. Macam burung hantu. Aku pun memang dah ada eyebags, nick irc aku pun Panda_Eyes. Ha, cocoklah tu. Lepas ni boleh upgrade jadi raccoon eyes. Eh, ke tak payah? Timeline Twitter makin rancak. Makin malam, makin laju pula dia bergerak. Malam ni, mereka berborak tentang banjir di KL. Memang Twitter ni sumber berita yang paling pantas, tak payah tunggu tv. Twitter, on. IRC, dengar Gufymike bercerita tentang Haskell di #scum-scans. Lepak di #lurk, ah, merepek #lurk. Kalau tak cerita tentang gaming, mereka akan merepek tentang DFC dan loli. Tak pun melayankan racism thinwhiteduke atau trolling Hildr. Aku melompat ke browsing. Walaupun aku ni taik internet, tapi aku jarang browsing berjam-jam. Buka satu website dan biarkan dia di browser berjam-jam selalulah. Website yang aku boleh layan lama-lama macam reddit, irz.de, cracked.com dan 4chan pun bukanlah website yang boleh masuk kategori safe for work. Ok, reddit memang safe for work, tapi subreddits yang aku suka lepak, kebanyakannya… maaf, tidak selamat untuk hidup. Jam berdetik, aku membazirkan masa lagi. Buku beratur di samping, menantikan untuk di baca. Air di jag, lebih separuh habis. Aku masih browsing, dengan alasan mencari bahan bacaan. Di luar, gelap gelita. Senyap sunyi pada jam 2. Dan di keheningan malam, aku menjadi teringat masa lalu. I am glad I make you feel the same. Damn you sly Apollo, why can't you just give me what I want? Or even the freezing breath of Hades? Damn you sadistic Apollo, why can't you just give me what I need? Or maybe a follower of Bacchus? Should I just invoke Zeus' wrath? My uncle came with his wife, 4 of his children, and 3 grandchildren. Our home was turned into something filled with people. There's noise, everywhere, and persons all over the place. It was okay I guess. Although my brothers had to share a room due to one of theirs was used as the guest room. Ah well. At least grandma had fun. Some said I'm such a contradictory person.